Hey everyone! I just wanted to pop in to let ya'll know that today's the last day of the 50% off Wet 'n' Wild sale at Walgreens. 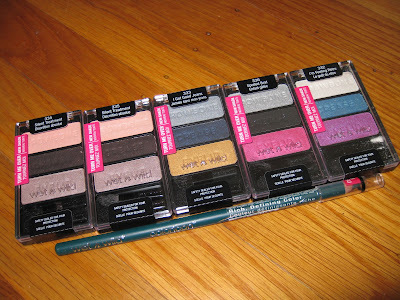 All week, I've been on the lookout for the new Wet 'n' Wild products and finally found a small display yesterday. 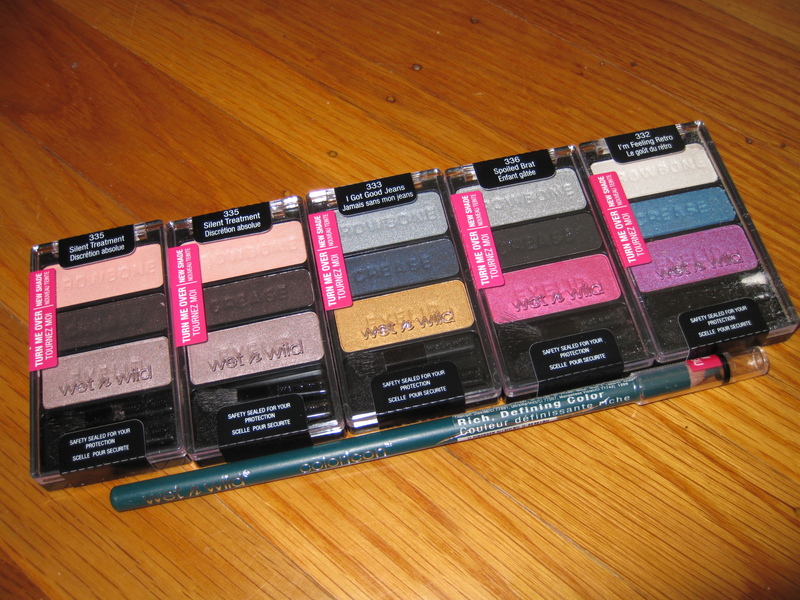 I picked up every trio palette available (from left: Silent Treatment (x2), I Got Good Jeans, Spoiled Brat, I'm Feeling Retro) and a Color Icon pencil (in Green). The palettes were all $1.50/$1.49 and the pencil was 50 cents! I wish they had more but the only other products available were the Shimmer Pencils and new glosses -I'm still looking for the 8-pan palettes. If you can't find any of the new products, grab a rain check. You can always use it (and still get the sale prices) when the products come in. Can't wait to try these out! What are your plans for today? On my to-do list? Taking loads of product photos and working on reviews. I also want to update on some MAC collections but we'll see.. Happy Saturday everyone! i bought some stuff! i didn't see any new palettes at my walgreens but i'll be on the lookout! I got some great stuff too!! love your picks btw. @ siwing.. Whoa I just looked at your page again and I could've sworn I commented on that post! You got some great stuff. =) Get a rain check if you don't find the new products there yet. @ Tara.. You did! I got one of those Lip Shimmers a while ago too but don't even know where I put it. =\ I have the blush too but haven't tried it yet! I'm so behind..
@ charlne-ann.. I can't wait to DO some looks. I've been so busy I haven't had the time to actually do "full looks" -lately it's been only lipstick or only blush to test products for review. Hopefully I get to do one soon! oh man, I really want to load up on these. You have no idea. But I have so much eyeshadows. gah! but this is such a great sale, haul, and WNW's collection.